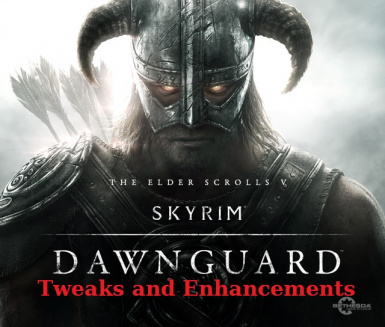 This mod changes several things in both the Vampire as Dawnguard questlines. Uploading for SSE, to bethesda.net and for consoles is allowed under the same terms, but in addition don't expect any technical expect support from me in that case, if the mod doesn't work on any of those platforms. - Couchwarrior: for inspiration to add extra dialogue for Serana to (dis)allow her raising the dead. THIS MOD NEEDS A NEW GAME, or at least not having started the Dawnguard starting quest. dlc1rhtotalruncount should be at 1 after you complete this quest. you might be able to get away with using the command set dlc1rhtotalruncount to 1, if the first quest doesn't do that by itself, but nothing is guaranteed. I won't be able to help you if it breaks. So if you don't want the hassle, THIS MOD REQUIRES A NEW GAME. Fuz Ro D'oh is required to see the text of some unvoiced dialogue. A. Adds radiant quest requirements in order to advance in the Main Dawnguard and Vampire Questlines. B. Increases the scale of the sieges of Fort Dawnguard and Castle Volkihar by adding some more NPCs. C. Adds some extra dialogue to expose Travelling Bards/Pilgrims/Merchants in the Radiant Dawnguard and Vampire quests. D. Adds new dialogue to Serana to allow/disallow her to raise undead minions. Each main or radiant quest you do for Dawnguard or the Vampires will count towards a total. This will show you the amount of quests you've done for the Dawnguard/Vampires. so 1 -> 2 means: the count is 1 at the start of the quest and turns into 2 at the end. If you're unsure what to do next, I suggest you talk to any of the quest givers (in Castle Volkihar or Fort Dawnguard, depending on your faction). They'll inform you whom you should talk to next. If you're unsure what your current progression is, open the console and type: getglobalvalue dlc1rhtotalruncount. This will show you the current amount of quests you've done for your faction. Then you can track your progress in the progression list posted above. - Fort Dawnguard: the Dawnguard are known Vampire Hunters and will be prepared. I've added many additional Dawnguard, huskies and armored trolls to defend the Fort. You stand little chance if you storm through the main gate. So you'll have to find an alternative entrance. I added an extra trapdoor in the Bear Cave so you can enter Fort Dawnguard that way. Once inside, you can open the gates and turn off the lights by pulling the handle upstairs. - Castle Volkihar: (WIP) I've added a lot of extra vampires, thralls, skeletons, gargoyles and death hounds to defend the castle. This was suggested to me by peacockfeathers2 on the /r/skyrimmods subreddit. I've added some persuasion dialogue that you can use to expose them if your speech skill is high enough. With the right perks you'll need about level 50 in speech to succeed. This was inspired by the "Korvelain, the Demon Hunter" roleplaythrough of Couchwarrior. It should be self-explanatory what it does.